100 Tonson gallery is proud to present Araya Rasdjarmrearnsook’s new exhibition “An Artist is Trying to Return to ‘Being A Writer’ ”. On an occasion of the artist turning 60th, 100 Tonson gallery invites Araya Rasdjarmrearnsook to return to being a writer. One of the most prominent Thai artists with international acclaimed, Araya Rasdjarmrearnsook’s work was represented in various high-profile art events, including DOCUMENTA (13) Kassel, Germany (2012); 51Venice Biennale, Thai Pavilion, Venice, Italy (2005); and her first retrospective in the United States at Sculpture Center, New York in 2015. Throughout her career of over 30 years, Araya’s works have been examining mourning and loss, feminism, spectatorship and animals. Unlike her well-received visual art practice, her writing has rarely been observed by the international art world, partly due to her highly specified use of Thai vocabularies. In this exhibition, Araya is presenting her deep-rooted ‘unresolvedness’ between her two practices that has never reached the pinnacle. For this exhibition at 100 Tonson Gallery, Araya presents her new sculptures and videos including ‘The Cruel ’ (2017) a humorous reenactment of the artist’s habilitation meeting where other esteemed professors whom are also important figures in Thai art world, critiquing the artist’s controversial works which were never accepted in the academic circle as well as the general public in Thailand. The critique indicates the tension of what constitutes permissible or moral within the national art scene. The Cruel is then echoed partly in another video titled “I was just told that my work is more or less too sad for Christmas” (2017) A conversation between two women about death, sickness, joyful of youth and long-awaited desire. They discuss each issues with more profound and much philosophical than what ‘The Cruel ’ is presenting in their realm, both videos set to bombard each other at the entry way to the exhibition. “Niranam Yummayooshi” (2015) is a soundless video accompanied by two sleeping figures titled “The Dead Ovary Lullaby” (2016) where both, a woman and a dog fall asleep under a glimmering light. They then travel to different dreamscapes, the ocean, and the grasslands or on top of an injured skin. Meanwhile, an image of a body started to form, layered and simultaneously dissolving its origin. Together, collaged with fragments of mundane experiences such as running and playing, to be wounded and to be covered. 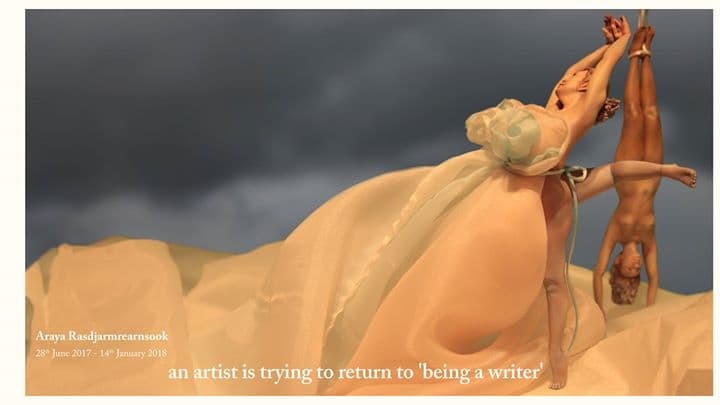 A sculpture titled “An Artist is Trying to Return to Being a Writer” are displayed in two bodies, in two different states, presence and shadow, glorious and despair. Fixation on imposing boundaries and restrictions in national art stage in the first two videos, juxtaposing the sculptures and fanciful dreamed projection are just like two sweet rivals—presence & shadow, representation & repetitiveness, tranquility & conclusion, birth & death. All of this knitted and intimately bounded within “An Artist is Trying to Return to Being a Writer”. Perhaps visitors can trace and weave the faint sound of poetry that may impose itself within the exhibition. 100 Tonson Gallery cordially invites all visitors to the opening reception on 27 July 2017 from 7:00 pm onwards. Further announcement on public seminars will be released in due time. The exhibition will be on view from 28 July 2017 until 14 January 2018, Thursday – Sunday, 11:00 am – 7:00 pm. For more information please contact us via info@100tonsongallery.com or call +66(0)2-510-5813.